“Sleight of Hand.” An episode of The Rockford Files (Season 1, Episode 15). First air date: 17 January 1975. James Garner, Noah Beery, Joe Santos, Tom Atkins, Lara Parker, Pat Delany, Allan Miller. Teleplay by Stephen J. Cannell & Jo Swerling Jr., based on the novel Thin Air by Howard Browne. Stop me if you’ve heard (or seen) this one before. Private eye Jim Rockford is coming back to LA after a vacation trip with Karen Mills, his current girl friend, a vivacious young divorcee with a three year old daughter. He stops at her house, she leaves to open the front door, he carries the girl up to her bedroom and tucks her in, and goes downstairs to find Karen’s open purse on a counter – and no Karen. He was only a few feet behind her when he went in — and she has disappeared. Or in other words, Rockford’s on his own in solving this one, except for his dad, Rocky, who catches the one clue Rockford misses. The novel has been reviewed earlier on this blog, and from Gloria Maxwell’s description, the story line of the TV show is almost exactly the same, at least the beginning. While I’ve read the book, I couldn’t tell you now if the ending is the same, nor how closely they followed the plot when the story was used again as the basis for an episode of Simon & Simon in 1982. I have to tell you, though, as entertaining as the story is on this mid-season episode of The Rockford Files, if you allow yourself the time to think it about carefully, and maybe only casually and not even that carefully, the whole thing is adroitly administered hogwash, a heap of impossibilities disguised as a stack of highly unlikelies. It may be that 50 minutes or so just isn’t enough running time to make the parts fit together so they make sense, but in all honesty, they don’t. But did I say that this was one of the most entertaining episodes so far this first season? I did and I didn’t, but it was. It also comes the closest to true noir, albeit in a slightly ham-fisted way. As private eye Jim Rockford, James Garner lets his feelings show more than usual on this one. Wasn’t the pilot for BOURBON STREET BEAT also based on THIN AIR? Roy Huggins was never one to let a good idea rest when he could reuse it. IMDB says the first episode was based on Howard Browne’s “The Taste of Ashes,” a Paul Pine novel. I don’t think I’ve sever seen an episode of BOURBON STREET BEAT. It was on ABC the first year I was away at college, and the only channel we got in the dorm was NBC. We saw an episode of BOURBON STREET BEAT on one of the higher number cable channels just last year, so keep an eye out, Steve – it’s out there. It’s certainly one of my favorites, too, Jamie. Rockford is no great thinker, perhaps, but he’s clever and he gets the job done, usually with a good wink to the audience that says he’s having a good time. Seeing the series on DVD now, though, I notice things that didn’t bother me when I watched the show when it was first on, such as the time wasted watching cars on the highway or city streets, traveling here and there, not to mention planes taking off and landing. Yawn. Filler, all of it. Lots of car chases too, with tires squealing around corners and hubcaps flying off, and clothes for the men that no one would be caught dead wearing today. The ladies, though, all very nice. The stories are good, however, and all in all, they’re all highly entertaining. I’ve also seen scattered episodes of BOURBON STREET BEAT for sale here and there, usually on anthology type DVDs, as I recall, but as of this afternoon, none of the usual sources are turning up complete sets. Perhaps the lid is being held on tight, and collectors are being cautious. BOURBON STREET BEAT only lasted a single season, but the main character played by Richard Long was moved to LA and became part of the 77 SUNSET STRIP team for at least a year. Both the New Orleans setting and the fact that Andrew Duggan was older and more mature than the usual Warner Brothers tec line-up made it a bit different than STRIP, HAWAIIAN EYE, or SURFSIDE SIX. ROCKFORD could swing from brilliant to mind numbingly repetitive. The car chases were a pain and because of network restrictions about the only action allowed at the time, and I would have given anything if they had done a ‘very special episode’ and killed off the annoying Angel (Stuart Margolin), an actor and role that Garner found endlessly entertaining, but who grated on my nerves like a root canal without Novocaine. But when they tried the series did some memorable episodes — the comic ‘Lance White’ appearances by Tom Selleck or a strong two parter about the abuse of the grand jury system by over zealous prosecutors (with William Daniels excellent as the prosecutor in question). Sadly too many episodes were just an excuse to give work to Garner’s buddies or to drag in Issac Hayes or Margolin for yet another hour of Garner’s pained looks and tires squealing during endless car chases and tiresome car stunts. To this day I can’t watch a car chase in a TV show. Between ROCKFORD and CANNON I have seen all I ever need to see. What I recall of ROCKFORD was a lazy show that most weeks didn’t bother and fell back on Garner’s considerable charm and the likability of the rest of the cast (notably the great Noah Berry Jr. as his dad, Rocky). A few times a year they would make and effort and do something a bit unusual, but far too often it was cookie cutter plots revolving around the annoying Angel, reaction shots of Garner, and the boring car chase of the week. You kept watching, because you never knew when they were going to do a really first rate one and because Garner is watchable even when he isn’t doing anything, but never was so much good will thrown away on so little, and they don’t hold up in repeats. That just how little was going on only becomes more obvious. In spite of time wasted on car scenes, I like the series a notch or two more than you do, David, but when I comes to Angel (Stuart Margolin), you and I agree 100%. I think IMDB must have it wrong. Of the 122 episodes of ROCKFORD the series, they say Angel was only in 40 of them. After a certain point, I’d have sworn that he was in all of them. I’ve been working through Season One on DVD, and Angel doesn’t appear until the episode after “Sleight of Hand,” which is about two thirds of the way through the season. Strangely enough, the pilot for the series, which was televised the previous spring, is not included in the Season One set, so starting from Episode 1 in the fall, as I did, it takes a while to catch up on some of Rockford’s background. Maybe we both disliked Angel so much a little seemed more than it was, but I would swear in later years he was in most episodes. Maybe only 40 actually revolved around his character. I did enjoy the books Stuart Kaminsky wrote using Rockford and the characters from the series though. The first season was mostly good, and later seasons had some fine episodes mixed in with the bland and average though toward the end Garner was obviously getting tired and in pain and ready to be rid of Rockford. My impression of the series was always that Garner and Huggins were both cruising on their reputations. Once in a while they would brush off the dust and show us what they were capable of, but far too often the series seemed to mostly be about Garner’s passion for driving fast cars, and at some point, no matter how good the stunts, all that adds up to is an hour a week of right turns made at high speed. I guess we should count ourselves lucky Rockford never took up Garner’s other passion — golf. As for Angel, I know about a dozen people who feel the same about him as we do. He seems to have had only one real fan — luckily for him that was Garner. That final MAVERICK series Garner did wasn’t much better, and when Margolin showed up as a half indian scout I just gave up. But I would have liked ROCKFORD a lot better and stayed with it a lot longer if not for the seemingly endless episodes about or featuring Angel. Howard Browne wrote for most of Roy Huggins TV series going back to Maverick (I think). The reusing scripts was common practice in the early days of TV. Warner Brothers shows often reused old movie plots and old movie footage to cut cost and speed up production. I was a TV critic for Louisiana newspapers during the late 70’s, early 80’s and Rockford Files was one of the best in the overdone genre at the time (the era of the gimmick PI). I find it hard to watch now, but I say that for nearly all TV from that era. The show works less on plot and more on characters and strong dialog. My favorite character was Beth Davenport (Gretchen Corbett), Jim’s lawyer and one of the most realistic (thus too rarely used) women characters on American TV at the time. The interaction between Beth and Jim always was the highlight of any episode. I still remember dialog from the show. A great example was when Jim got shot in the face near the eye. Rocky was bitching about why he did not quit, that the bullet an inch to the left would have taken out his eye. To which Jim replies. It was that charm that made Rockford Files a series better than most. Or the moment where Rockford’s police buddy agrees to hand over some information in return for his Lakers tickets. Jim asks why his normally upright friend thinks that it’s alright to hustle him. I must admit that I never saw the show during its original run, and I’ve never seen the repeats, either. The current reshowing in the ‘wee small hours’ is the first time that I’ve ever really seen the show, and I’m enjoying it. Perhaps your fan boy love of detective stories has clouded your judgement. 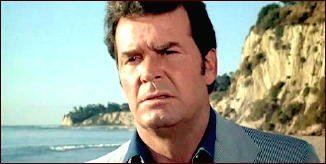 Rockford Files has consistently been judged by critics as one of the finest one hour dramas ever on television. You boys seem to be way off, Rockford ran against the type of tripe many of you crave. What you don’t understand is at that time NBC ran a family hour which made it highly difficult to portray adult or extremely violent situations. Plus it was Maverick as a detective, a send-up of the corny macho detective, & the general wacky LA scene of the 1970’s. Some of the comments here are absurd, that Garner perhaps was cruising on his reputation. Hardly when he was taking a physical beating each week doing his own stunts. Name an actor who did his on his stunts year in and year out for 6 years?. I’m waiting… Angel wasn’t always funny, but mostly entertaining, and the car chases could get tedious at times. Small price to pay for such an excellent show and cast. I’m 69. It’s been a long time since I’ve been called a fan boy! Point taken Steve, meant no disrespect,it was the wrong phrase. Anyway great site, enjoying the contents very much. All points of view welcome here. Everybody’s opinion counts! And if I’m wrong on anything factual, I need to know about it. Whether we agree in toto or not, I’m glad to have you on board. Hope you’ll stick around. PS. Maybe I still am a fan boy!